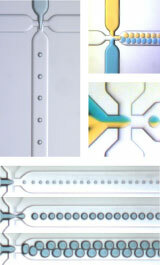 Droplet microfluidics is an exciting and rapidly growing area of research. Based on Dolomite's standard product range, the Micro Droplet Systems enable rapid advances in droplet microfluidics allowing users to produce more than 10,000 monodispersed droplets per second ranging from 5�m to 250�m in diameter. Each system provides a complete solution containing a range of Droplet Junction Chips with different junction geometries, channel sizes and surface properties. The chips have excellent optical transparency for clear imaging of droplets. The Micro Droplet Systems benefit a wide range of applications including compartmentalised chemistry, high-throughput experimentation, alginate polymerization and the production of monodispersed emulsions or beads.